okay, so i bit into it. 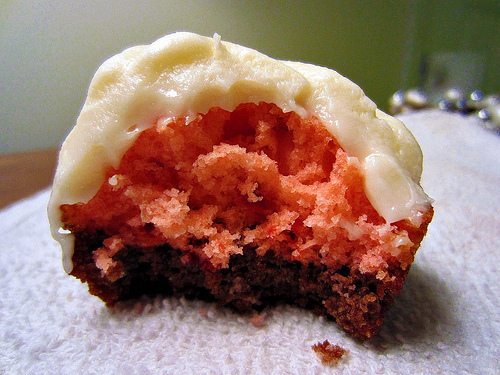 but you HAD to see this cupcake's insides. 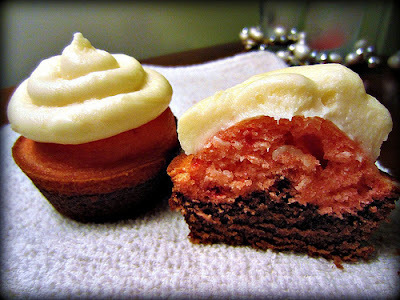 In case some are wondering what Neapolitan is, it's the combination of chocolate, strawberry and vanilla. I'm sure you had tons of it in ice cream form back when you attended magic show birthday parties or Easter Egg hunts. I remember it all too well. I would actually just eat the vanilla and chocolate ice cream and skip the strawberry. I was afraid of the little pieces of fruit. My, how much I've grown from then! This recipe is barely even a recipe. All you semi-homemade goddesses will love this one. I also think it's got the perfect color palette for a Valentine's cupcake! I'm sure your sweetheart would love to grub on one of these. You won't need much for ingredients. Just a box of brownie mix, strawberry cake mix, and whatever ingredients you need to make the two. 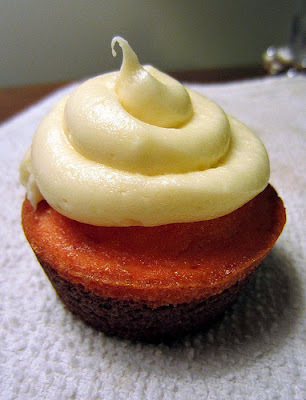 I iced them with a vanilla cream cheese frosting, but you could make any type you choose. Let's get started! 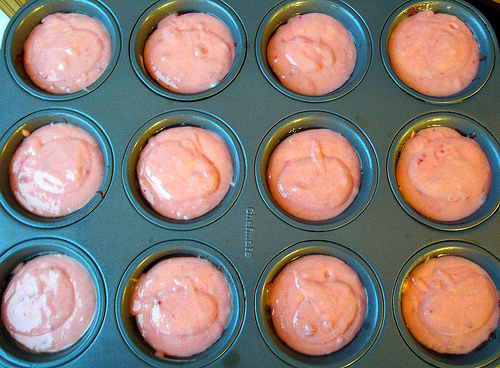 Preheat your oven to the temperature on the box of the strawberry cake mix. Spray your cupcake tins with non stick cooking spray. Then mix both the batter mixes according to the boxes and do them in separate bowls. 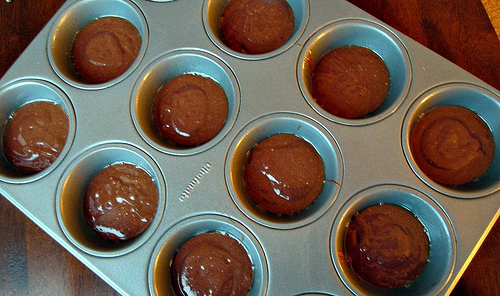 After you are done mixing, place a heaping spoonful of the brownie batter into each cupcake tin. After filling the tins with brownie batter, place about 3-4 smaller spoonfuls of strawberry batter over the brownie batter. You may have a little bit of batter left over once you're done. You can toss it or make some mini cupcakes like I did. Let the cupcakes cool completely. Frost with your desired frosting. I went with a cream cheese frosting but the options are endless. I'm hoping some of you guys will try and make these! I would be your Valentine for sure if you did! :) Happy Baking!